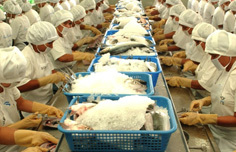 We devote careful attention to cold chain management − a critical factor in keeping the fish fresh and flavorful. 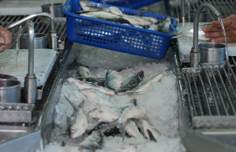 All our freshly harvested fish are immediately chilled in ice to maintain their quality and freshness, from the time they are taken out of the water until they reach the processing plant, all throughout processing until they are blast frozen and finally stored at –18 degrees centigrade. To ensure that all our freshly harvested fish are kept as fresh–tasting as possible, we maintain our own ice plant on the plant site. We produce 30 metric tons of fresh clean ice everyday, enabling us to lock in the freshness of each harvest. At our processing plant, we have three batch–type blast freezer units with a combined capacity of 8.5 metric tons per day, and the state-of-the-art Frigoscandia Spiral freezer with a capacity of 5 metric tons per day. Our on–site Cold Storage facility has a rated capacity to store 300 metric tons of finished products. Freshly harvested fish in the ponds packed in ice. 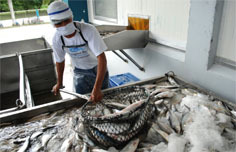 Freshly harvested bangus at receiving area. 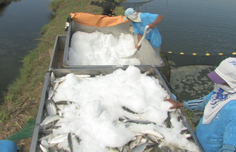 Cold chain: fish on ice while being degutted. Cold chain : fish on ice throughout deboning.